Just to the west of West Bali National Park, close to Menjangan beach, is Bali’s largest hot spring. Considering that Bali has so few of these it is astounding that this place doesn’t receive more attention. The sulphurous waters in the pool here reach temperatures of 40 degrees Celsius. Many come here hoping that a dip in the water will cure them of their ills. Furthermore, the location of the hot spring creek in a mangrove area makes it a beautiful place. Most of the visitors to the springs are locals. Make sure to quickly rinse off in the showers before and after your dip. It’s best to plan to arrive during low tide though; during high tide the ocean actually submerges the pool. Hours given here may be unreliable. Please check official website before visit. How popular is Banyuwedang Hotspring? 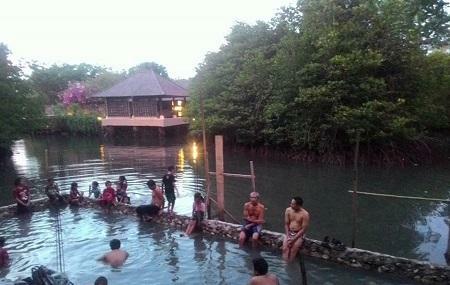 People normally club together Biorock Pemuteran and Pulaki Temple while planning their visit to Banyuwedang Hotspring. Nice place. The water is VERY hot but you'll get used to it soon. This seems to be a place more for locals as we were the only tourists around (which was quite funny because everybody was looking at us, smiling and waving), but as Balinese people are very friendly some locals chatted us up and we had a nice discussion. The entry fee is very reasonable (20k per person).